It is with great joy that I can announce: At long last The Cake Bible has been translated into the Spanish language! It is published by RBA Libros, S.A., and will be available in book stores in Spain tomorrow, October 20. The book was translated brilliantly by Rosa Tovar and Hector Wong has been his usual generous self, consulting on the translation and offering suggestions. Spanish is his native language and he offers this as a gift to other Spanish-speaking people. Hector reports to me that Rosa has been 100% faithful in keeping my voice. Do check out her blog--she is a well-known cookbook author and baker in Spain and has become a dear friend through this translation. I know many of you in the US would like to have this book and it is my great hope that the book will be distributed here. I will let you know as soon as I hear anything to that effect. If not, what a great excuse for a trip to Spain!!! Meantime, Hector has located the following link on Amazon where they will ship from Spain to the US. He also is under the impression that the book is paperback (tapa blanda). On another note, I should mention that this edition no longer has the original photographs of the cakes. The book was published before digital technology so the original photos were not available. Hector has created a facebook fan club! He, again most generously, has scanned all these beautiful original photos taken by VIncent Lee and they all will be on the facebook fan page shortly. They will serve as a guide for reproducing the cakes in the book. You do not have to have a facebook account to access the fan page. The stunning new photos in the book are intended to be inspirational and offer ideas of cakes that can be made using elements in the book. They were created by Patricia and Martin Arribálzaga Cakes Haute Couture and are truly a labor of love. Please note that in order to drape chocolate fondant as pictured on the cover, you will need to use commercial fondant, as homemade always cracks at the curve when draped. 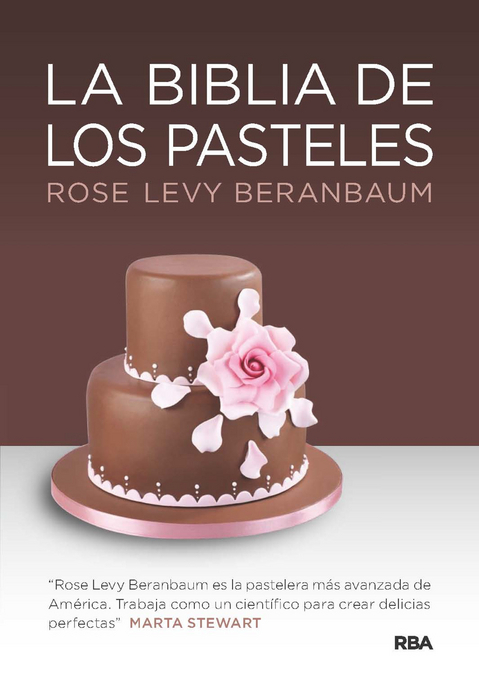 It may interest you to know that I was the creator of chocolate rolled fondant and it appeared for the first time in the original Cake Bible in 1988.Spanish translation of above by Rosa Tovar: Puedo anunciarlo con una alegría enorme: ¡Al fin The Cake Bible se ha traducido al español!. Estará en las librerías de España a partir de mañana, 20 de octubre. Rosa Tovar ha hecho una traducción brillante y Hector Wong ha sido su guarda generoso constante; ha cotejado con cuidado la traducción y añadido sus sugerencias. El español es su lengua materna y ofrece este gran esfuerzo como un regalo para la gente de habla española. Hector me ha dicho que Rosa ha sido fiel al 100 % a mi estilo y al contenido. Pueden consultar su página -es una repostera, cocinera y escritora de libros muy conocida en España y se ha convertido ya en una amiga entrañable gracias a esta traducción. Sé muy bien que a la mayoría de aquellos de ustedes que viven en los Estados Unidos les gustaría poseer este libro y tengo grandes esperanzas de que sea distribuido aquí. Se lo haré saber tan pronto como me lleguen noticias sobre este asunto. Si no fuera así ¡¡¡Qué excusa más estupenda para hacer un viaje por España!!! En otra nota dejaré constancia de que esta edición no lleva adjuntas las fotografías originales de las tartas. El libro se publicó antes de que existiera la tecnología digital, de modo que era imposible disponer de las fotografías originales. Hector se ha ofrecido -otra vez con enorme generosidad -a escanear las fotos para que pueda colgarlas y que así sirvan de guía del aspecto que tienen las tartas que yo diseñé. Las nuevas fotos despampanantes que aparecen en el libro pretenden ser un estímulo para el lector y ofrecer una idea de las tartas que se pueden preparar con las elaboraciones que contiene el libro. Las han creado Patricia y Martin Arribálzaga, de Cakes Haute Couture, y en este trabajo han puesto todo su amor. Por favor, tengan en cuenta que para plegar el fondant de chocolate que está en la foto de la portada, es necesario que utilicen fondant industrial, porque el hecho en casa siempre se rompe en las curvas cuando se dobla. Seguro que les interesa saber que fui la creadora del fondant estirado de chocolate y que apareció por primera vez en la edición original de The Cake Bible de 1988. IMPORTANT NOTE FROM THE PUBLISHER: ... el siguiente mensaje solo se aplica a la primera edición la cual ya se agotó. la edición vigente en venta carece de estas omisiones de imprenta ... ... the following message only applies to the first print which is sold out. the following prints on sale now have the omissions corrected ... Debido a un problema de imprenta y maquetación, se han omitido muchas lineas en la table de ingredientes medidas y pesos. Hector va a incluir las omisiones en el facebook fan page, y la editorial RBA España va a reimprimir las correcciones. Due to a problem with production printing, several lines on the table of ingredients measurements and weights have been omitted. Hector will include the omissions on the facebook fan page, and the publisher RBA Spain will reprint the corrections.